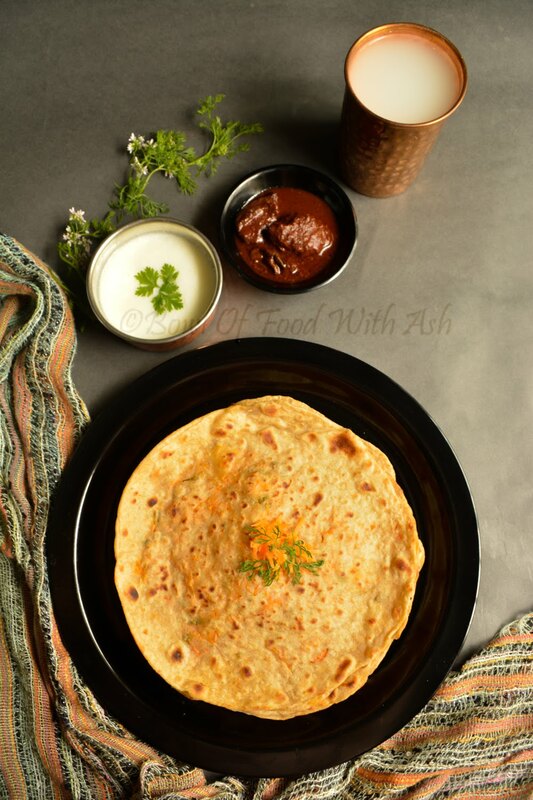 Carrot Paratha is WholeWheat Flat Bread Stuffed with Carrot and Minimal Spices. Carrot will be present in almost all meals either carrot salad,steamed carrot, carrot rice , pickle or paratha and so on..
Today was Carrot Paratha day :). Its very easy to make with minimal ingredients. 2 parathas with glass full of buttermilk makes you full. This paratha is great for kids lunch box too.I am yet to try on my 4 month old baby Iha when she grows up :). I am not sure what all ways I have to find to feed her veggies in future :). Lets make it before my baby darling Iha wakes up from her morning nap ;)..
1.Grate the Carrot and keep aside for 10 min and Squeeze the water from carrot and same water can be used to prepare dough. 2.To Make Dough,add Salt and Oil to Wheat Flour and mix well by fingers. 3.Now add water little by little to make soft dough. Keep aside for 10-15 minutes. 4.To Make Stuffing, In a bowl, add all ingredients under stuffing and mix well. 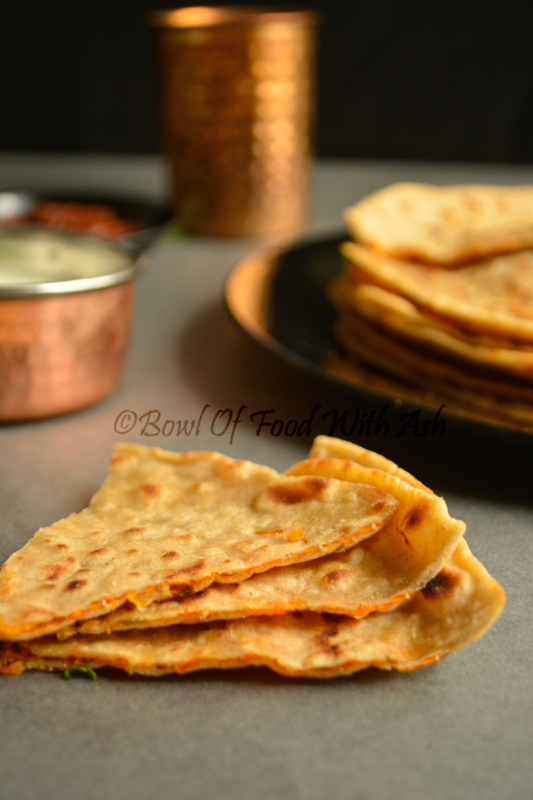 Click here to find step by step picture of making raddish paratha similar to this. 5.Knead the dough once again for 30 seconds and Divide the dough into lemon sized round balls. 6.Take 2 lemon sized dough and roll into puri size. Take stuffing(around lemon size) and place it on one rolled dough and place the other rolled dough on top of it and seal the edges. 7.Roll the paratha on dusted flour surface carefully. Don't apply too much pressure while rolling. 9.Let it get cooked on both sides.It will get brown spots. 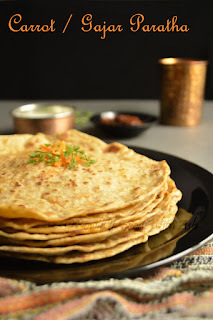 11.You can serve parathas with any raita or pickle. Click for more healthy and tasty parathas.